You might be asking why Copic markers and rocks, well let me explain. In case you have not heard rock painting is a thing. 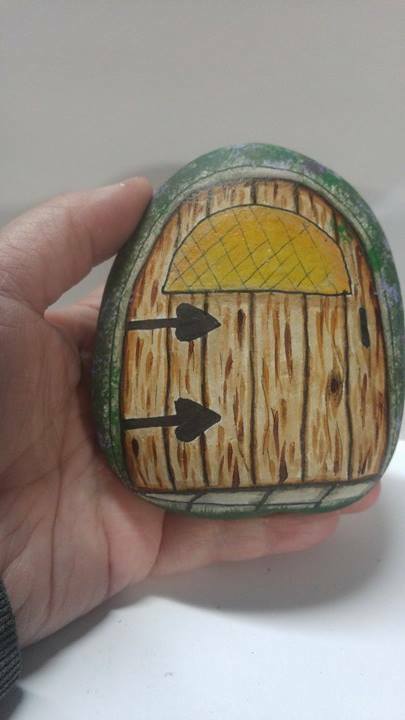 There are groups of people all over the place that paint and hide rocks for other people to find. They are meant to be inspirational and brighten someones day. I'm part of a local group. 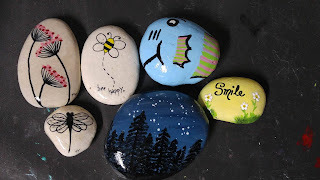 Here are some rocks from my last batch that I painted. These were done with acrylic paints and black markers. I've even water colored some. 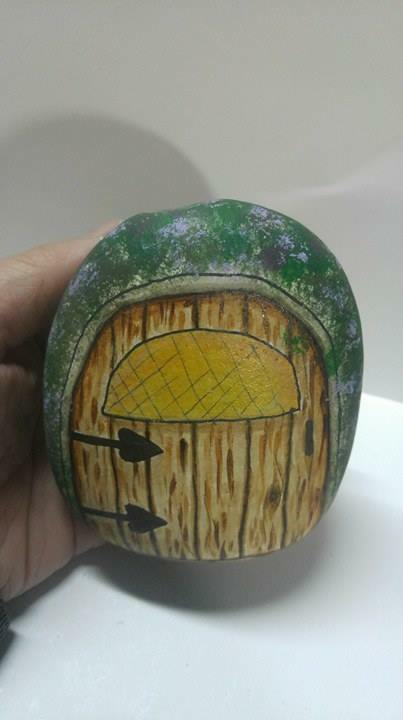 But what I have never tried was Copic markers on a rock. I saw in a group some where on Facebook that someone had used the Chameleon markers so I figured why not try Copics. I started with my rock and a inked line drawing on my rock. 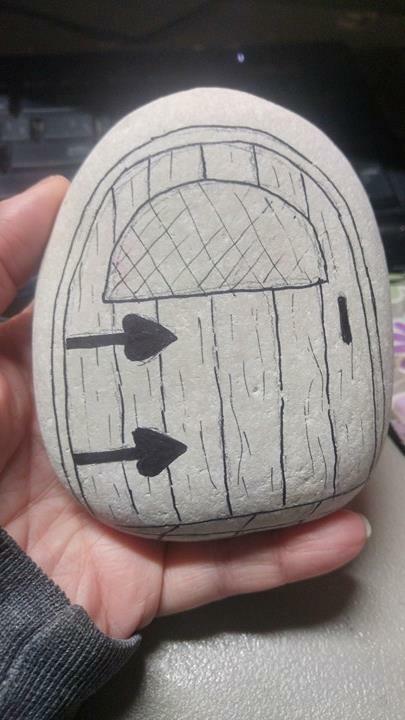 A simple fairy door. 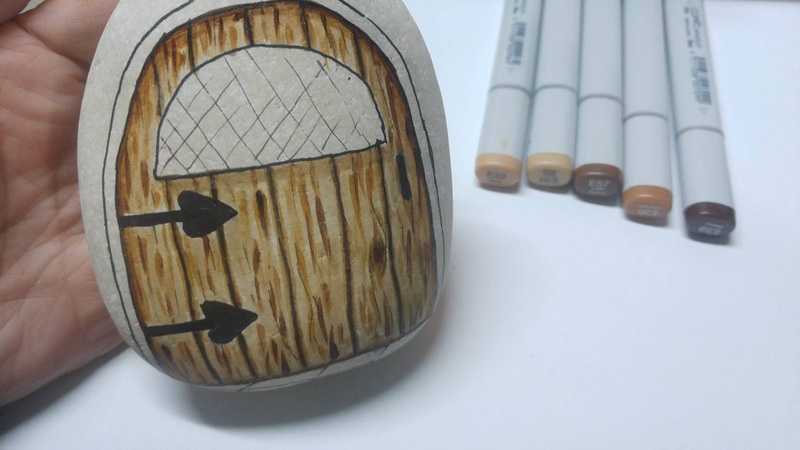 The thicker lines were done using Staedtler Lumocolor and the thin lines in the door and window using a fountain pen. 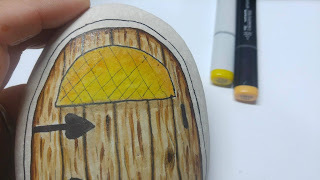 I figured I would start with the wood texture on the door and try coloring that in. I chose to use E31, E33, E35, E57 and E59. I stated with the lightest color E31 but soon realized that the Lumocolor was not Copic friendly, it smudged. I did my best to avoid touching any of the Lumocolor lines with the Copics. The fountain pen was safe to color over. I flicked in some of the E33, E35, E57 and shaded around the door. I darkened the Lumocolor lines with the E59 to ad some depth. I then went back over everything with my E31 to blend and then flicked and shaded some more. 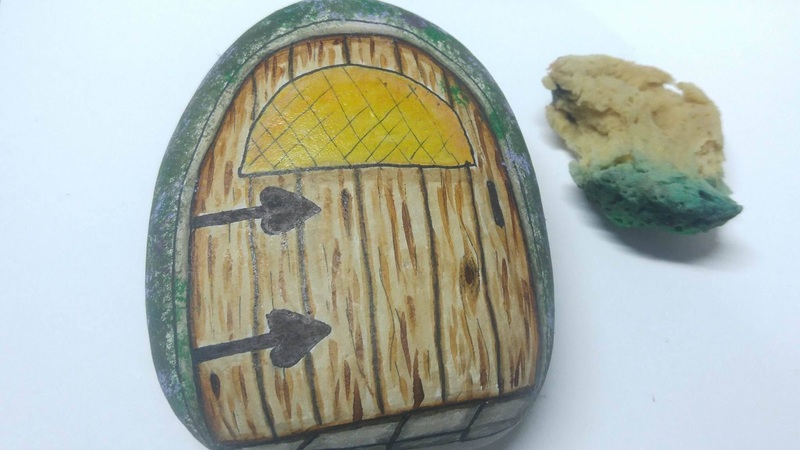 The only thing I noticed was, at one time there seemed to be a build up of ink on the rock because after so many layers it didn't seem to be absorbing in. So I figured I was done then. I went on to color in the window using Y15 and YR12, again avoiding the Lumocolor lines. Next I colored in the stone around the door and at the bottom of the door using W2, W3 and W5. For around the door I wanted a grown in flowery look so I opted to switch to acrylic paints and a sponge. Sponged on a dark green for the base, then a light green for some highlights. I then went in to a few spots with a dark purple and light purple to give the illusion of flowers. I dry brushed some dark green and light green acrylic to the bottom of the rock for grass and called it a day. All that is left is to seal it with a sealer. 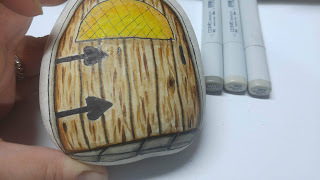 Do Copics work on rock? Yes they absolutely do. However I will use a liner pen that is Copic friendly next time. I just did not think to test out the Lumocolor first so that was my fault for using it.